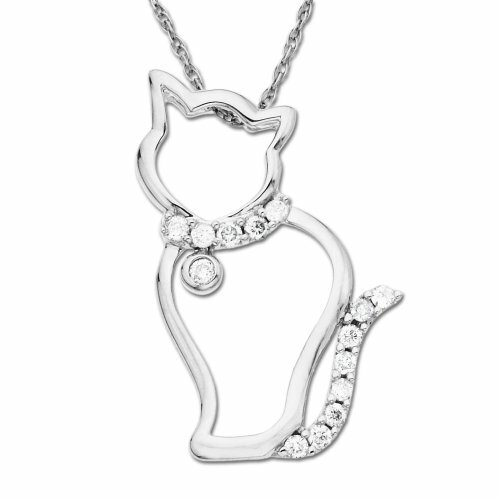 You are here: Home Cat Jewelry 14k White Gold Diamond Cat Pendant (1/8 cttw, I-J Color, I2-I3 Clarity), 18"
This irresistible feline pendant shines in 14 karat white gold, with shimmering diamond accents. She strikes a charming and elegant pose, showing off her collar and tail, which sparkle with 14 round prong and bezel set diamonds (1/8 cttw). An 18-inch light rope chain, also in 14 karat white gold, threads through the top of the pendant to complete the design. Enjoy this pendant with the chain provided, or purchase a different gold chain of your choice.